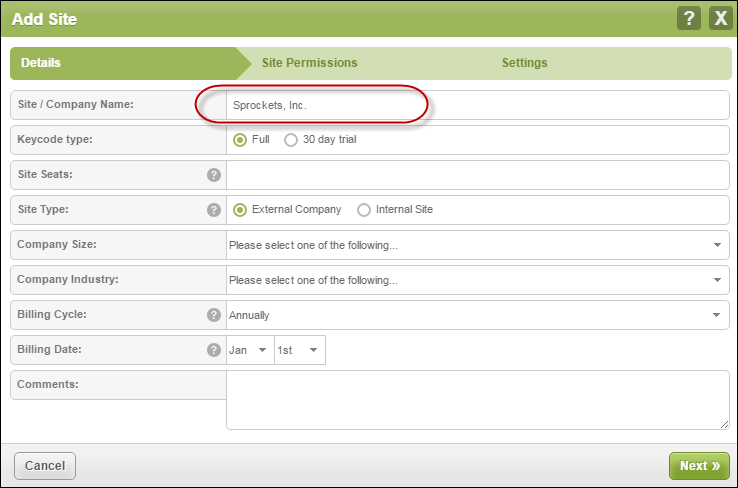 Use this procedure to add sites to the portal. You can also use the same panes and windows to edit or update site information. From the Sites console, click the Add button or the Pencil icon. The system displays the Add Site window. Note: The Add Site window and the Edit Site window have the similar fields for information, and function in the same way. In the Site/Company Name field, enter the name of the site. In the Keycode type area, select either the Full or 30 day trial radio button, depending on your needs. In the Site Seats field, enter the number of seats for the new site. If you are creating a site that is an external customer purchsaing services from you, select the External Comapny radio button, then continue with step 6. 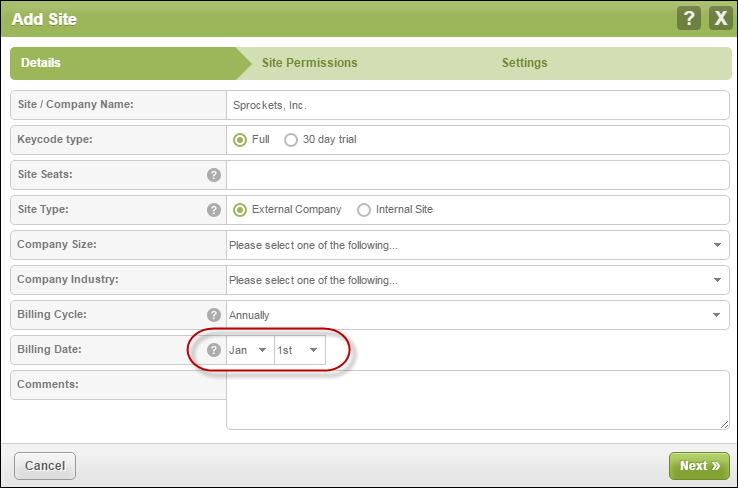 If you are creating a site that is an additional location or office within your own company, select the Internal Site radio button, then click the Next button, and continue with step 11. 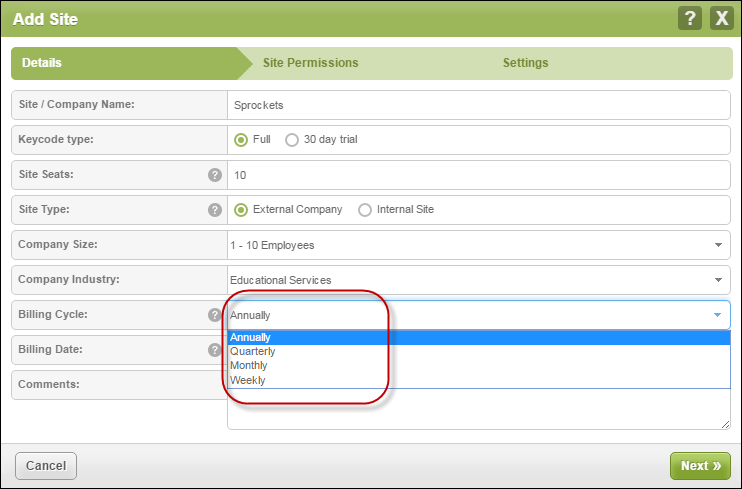 If you selected the Internal Site radio button, the Company Size, Company Industry, Billing Cycle, and Billing Date fields do not display, and you do not have to populate them. 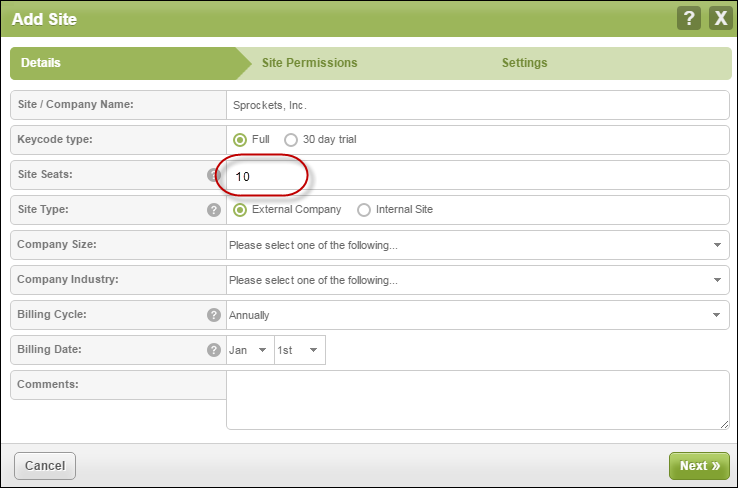 In the Company Size field, from the drop-down menu, select the range that best represents the size of your company. In the Company Industry, from the drop-down menu, select the industry that best represents your company. In the Billing Date field, use the drop-down menus to select both the month and the date. In the Comments field, enter any information required. This is an optional field. 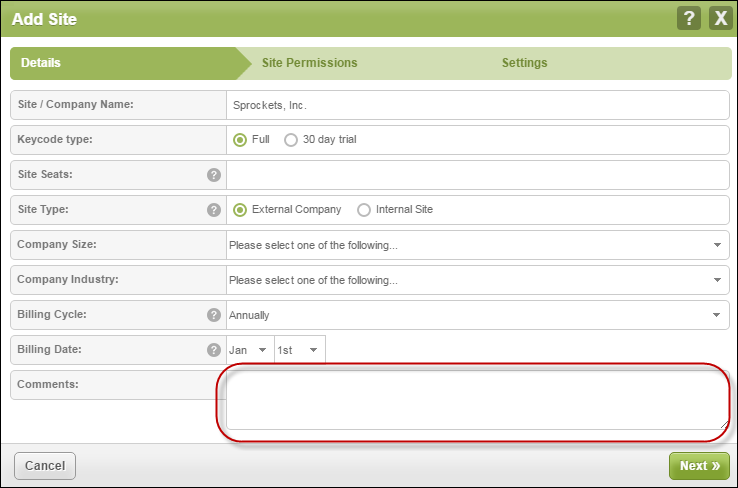 The system displays the Site Permissions panel of the Add Site window. The system displays the Settings panel of the Add Site window. To include global policies, select the checkbox. To disinclude global policies, do not select the checkbox. 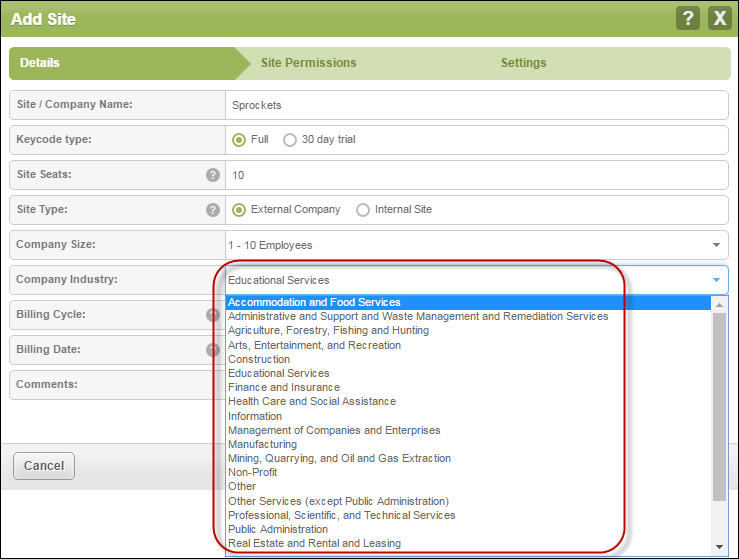 To include global overrides, select the checkbox. To not include global overrides, do not select the checkbox. In the Report Distribution List field, enter the email adresses of the individuals to whom reports will be sent. Use commas to separate email addresses. For more information on report distribution, see Global Site Manager Reports Overview. In the Data Filter field, from the drop-down menu, select one of the filters to determine what data displays. When you're are done, click the Finish button. When the process completes, the system closes the window, and the new site displays in the list on the Sites console.